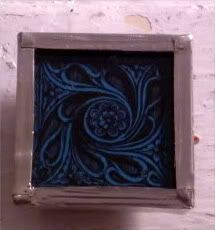 I picked up this tiny homemade magnet at the Fort Tryon Medieval Festival, at a booth where they were selling stained glass panels as art - on magnets, lamps, etc. How pretty! It always amazes me that people were making stained glass as far back as Medieval times. Even more amazing, that some of those specimens still exist. Just think of all the days and nights and years and decades and centuries - and weather! - they had to go through to make it to now, it's kinda mind-blowing. Almost as mind-blowing as that Michelangelo that turned up behind someone's couch near Buffalo. No. Really. Apparently, some family member shipped it to America in the 1880s, and it's been with this one family since...and somehow, it was just hanging around behind a sofa. They're still verifying it, and I dunno if I believe it, cuz it's a bit of a crazy story. Who's buried in Grant's Tomb? The cousins have the blue box! What IS it about a man and his horse? What makes a keepsake, a keepsake?